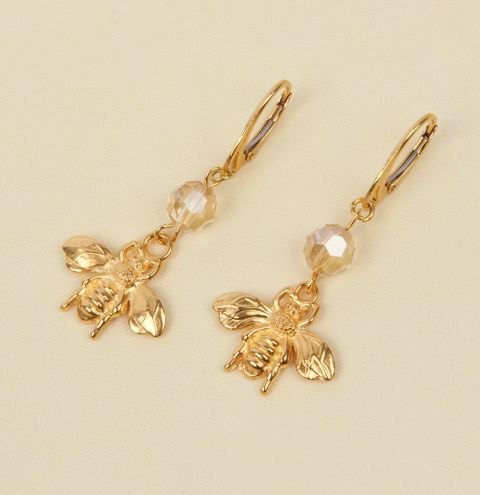 *MINI-MAKE* Make a cute pair of Honey Bee Earrings for Summer with our new charms and Swarovski crystal faceted round beads! As featured on the Beads Direct Blog. Take an eyepin and thread it through a Swarovski bead. Using your pliers, bend the eyepin to a 90-degree angle just above the bead. Trim the eyepin to leave 1cm. 2. Using your round nose pliers, bend the eyepin around them to form a loop. 3. Open a small jumpring by twisting the ends away from each other using your pliers and connect the bead onto the earwire closing the jumpring through the bottom loop. 4. Carefully open the bottom loop of the eyepin and close it onto the loop of the bee charm. Repeat these steps again to make your second earring.